At the Pioneer Club, mid-70s. 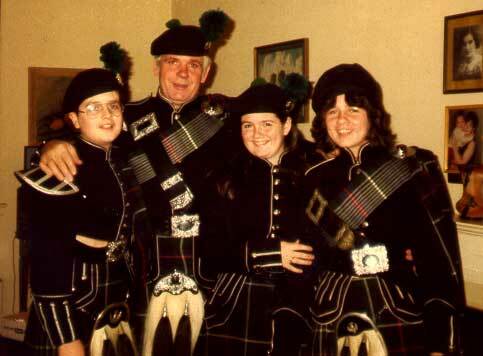 "Bertie" Patterson, a native of County Monaghan (Rockcorry), began instructing the band in the mid 1970's and was the first Pipe Major to take the band into the competition arena. 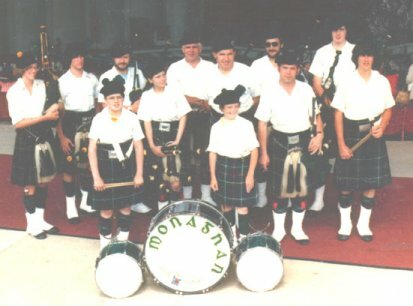 Front Row L - R: Pipe Major Bertie Patterson, Annette Duffy, Pipe Sergeant Brian Mulligan Second row: Peter Duffy, Dan Donnelly, Mike Evans Third row: Michael McDermott, Kevin McDonald Fourth row: tenor drummer Linda Duffy, bass drummer Thomas McDonald Fifth row: Drumming Instructor Gregory McLaughlin, Drum Sergeant John Mulligan, side drummer Martin Duffy. Garden State Art Center in 1979. Back Row (more or less) L - R: Rosemary Hardding, Brian Mulligan, Timmy Smith, Annette Duffy, Peter Duffy, Thomas McDonald, Mike Evans, Kevin McDonald Front row: Martin Duffy, Colin Smith, Pipe Major Bertie Patterson, Drum Sergeant John Mulligan .